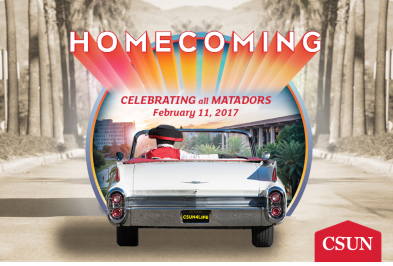 (February 1, 2017) - Calling all CSUN grads! Reunite with old classmates at Homecoming Feb. 11! Enjoy a BBQ, learn about the latest campus innovations, and jump on a shuttle to explore campus facilities. Race a pinewood derby car on the Matador Motorway. Cheer on the Matador men's basketball team. And get into the Matador spirit at the early evening pep rally. It’s nonstop excitement, games, food, fun and music. Enjoy it all while catching up with students you haven’t seen in years. And if you graduated in the class of 1966 or 1967, celebrate your 50th Class Reunion at the Founder’s Day luncheon. Alumni, students, relatives, friends and the whole community are invited to join the fun!